It’s such a slow, ongoing process, this home improvement thing, particularly with other calls on our time – namely the sheep and chickens, work, wanting to go out cycling and other jollies, and dealing with serious health issues (himself – stable now). 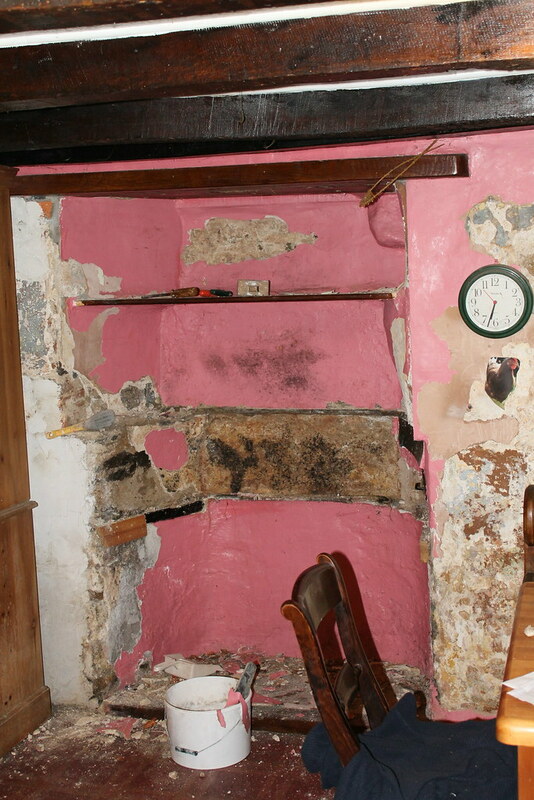 However we have now made a bit more progress in our kitchen – the previously blanchmange pink alcove (was it a window or a chimney?) 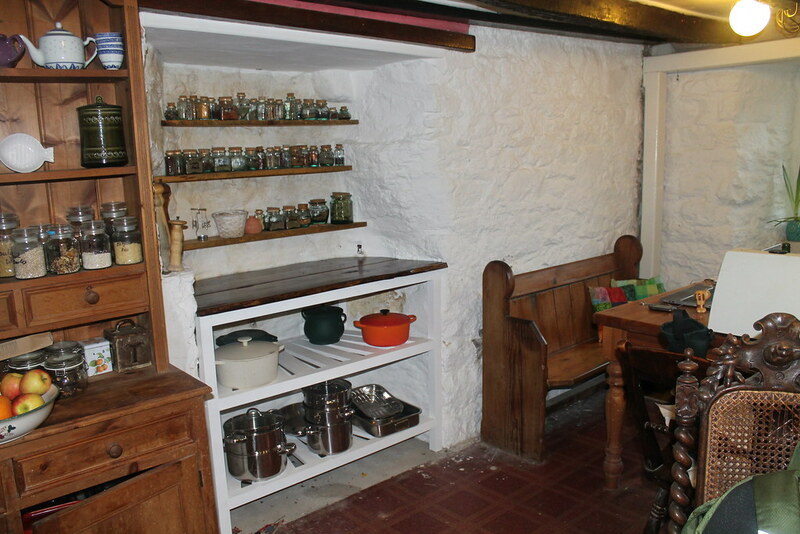 is now a mostly white alcove, sporting a new bespoke (we made it) free standing unit with reclaimed wood counter. No mean feat. The alcove had a huge layer of cement and many, many coats of gloss paint on it, all designed to hide the water feature behind… The incredible damp was dried out, the mud removed and the stonework repointed, the original brick hearth was found – yes it was a chimney – the original one we assume since the kitchen has another one, complete with the remains of a (sort of ) filled in bread oven, and a lot of soot. 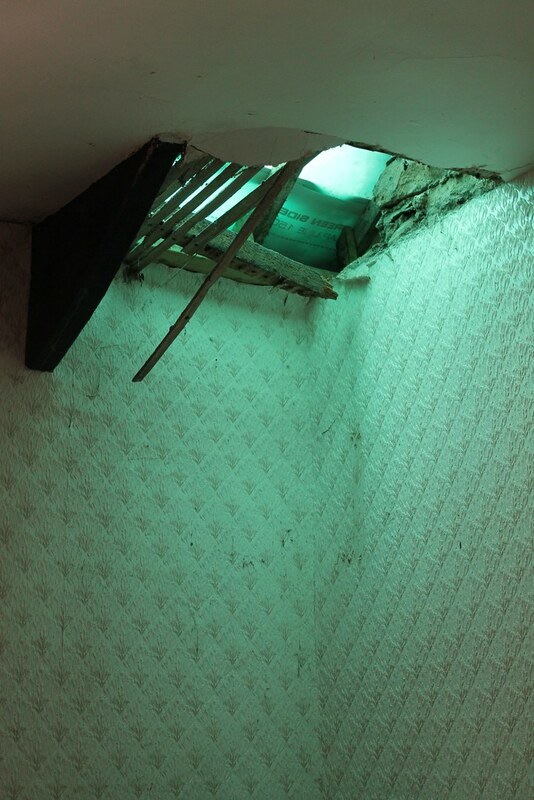 The chimney had to be insulated and capped off – more so than the previous owners efforts with a plank and a bit of fibreboard (no wonder there were so many drafts). We had a bit of a break then, re the health issues and a think about what we are doing, decided we like what we are doing, and picked up home improving again. Just before Christmas the aforementioned water feature made an appearance. It turns out if the gutter becomes blocked, the rainwater overflows and pours directly into our house wall – the walls being somewhat not straight – and the water turns up as a mini waterfall in the kitchen at the back of the alcove – hence the slight yellowing of the clay paint. This has been going on for decades, hidden behind the cement and gloss paint barrier. So we shall solve this problem from the outside and repaint then. And now we have a nice open fronted unit – open so the damp can continue to dry out, and I have put my nicer pans there (the more disgraceful ones can hide in a cupboard). I love the counter – made from reclaimed wood from a packing crate. 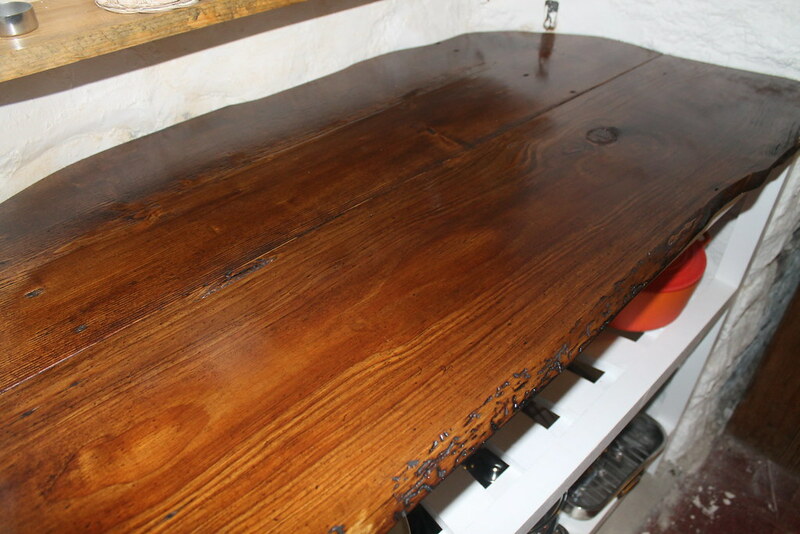 It looks shiny as I have just treated it with Danish oil, with built in wood stain. 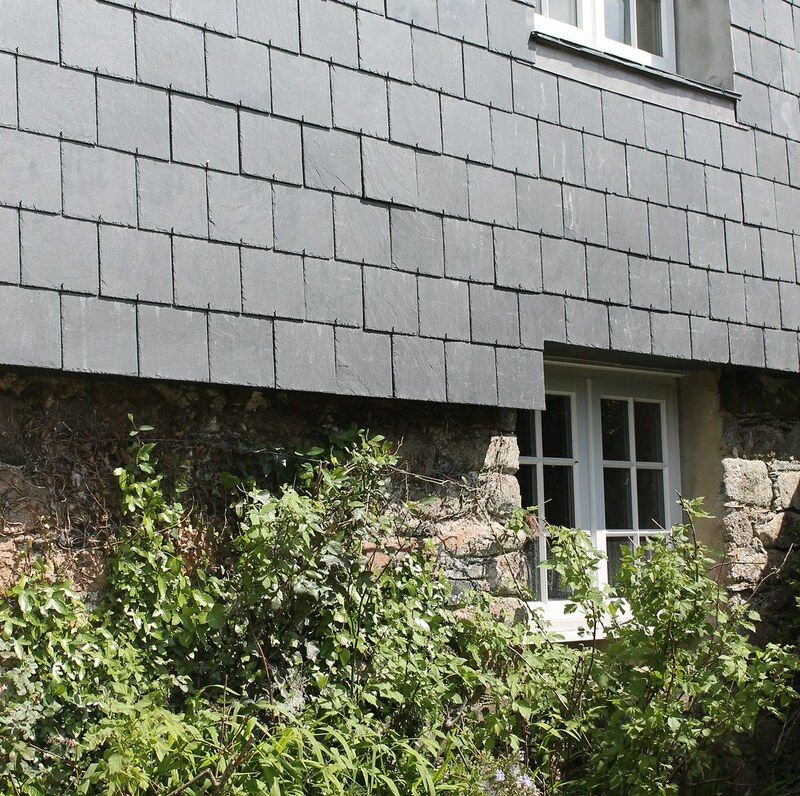 Last month we had the roof and the vertical hanging slates replaced. We had been putting it off, of course, due to the major upheaval and cost, but it was always on the cards. Then, once we had got the quotes in, spoken to building control, and gathered the funds, we waited patiently for our preferred roofer to become available – the good ones are busy. Busier still following the storms of this winter just gone, and we were anxious that the stripping the tiles part would be done earlier than planned by nature! We were set to have the work done in January and February, the worst time – thus the next available slot, but the storms pushed the timings around and April was free and became our turn. The roofers were lovely. Over the four weeks they were in our lives we got used to each other, formality was relaxed, they didn’t attempt to get me to make decisions until after my second cup of coffee in the morning, I got used to hearing them start work at the crack of …surely that time is still night? The moment the slates were all off, the heavy rains came. And they came in. Along with the roofer’s foot. We could have paid extra to have a big tent thing put up over the roof whilst the work was done, but it’s not really worth it, if you don’t mind the possibility of a little wet getting in. Unfortunately as they rushed to put the felt down in the rain, he slipped and hit a particularly rotten timber and his boot ended up in our spare bedroom. Right over where I work on accounts and such. Laths and plaster everywhere. He was so gutted and sorry – I was worried he had hurt himself. He made it all good, so no problems there, and need redecorating anyway. I was careful not to mention it in the village, him being the local man, but the people in the fish and chip shop already knew by the time we were buying chips that night… well he is the roofer’s next door neighbour. word gets around…. in fact the whole village came by for a chat, and to make sure we were reinstating the hanging slates and to approve etc. After the foot in spare room moment, I was fairly relaxed about the puddle on top of wardrobe thing, and the new spring coming out of kitchen wall. Each time he came around and worked in the heaving rain to fix a temporary cover. And I learned to check in the morning for anyone outside on the scaffolding before another accidental flash, and to get up uber early and caffeinate in plenty of time. And as predicted, one side of the timbers were completely rotted out – building control came and gave an opinion (another nice man), the work was done, and no wonder we had such damp problems on that side of the house. They were a positive joy to have around, safe, fun banter, we were able to get on with lots of other things like putting up the new greenhouse, going out for the occasional jolly, sowing a zillion seeds, renovating the kitchen, fetching new pigs, replacing a vehicle and generally not feeling obliged to hang around, nor chase them up, but it is still somehow tiring having work done. I’d use the same company again though – apart from the fact this roof should last us out. And then it came to an end, the scaffolding came down and normal life resumed, albeit in a drier less leaky home. We’ve been in recovery mode ever since, switching between trying to catch up on the digging and planting, and getting out and enjoying life – hence why I’ve been a bit quieter lately. Such a joy to have the work done, the high winds do not scare any more, and the house is drier than any time since we moved in. I have said many a time how you often find yourself doing something because a chain of events has led you to a job that seems wholly unconnected to the problem that started everything. Here I am in 2008 waxing on about how we are taking down a wall in the kitchen because himself wants a wind turbine, and how I said first things first, we should get rid of the gas guzzling rayburn first. Well, five long years later and we have finally taken out the rayburn, and it was slugs that started all this.. Anyhow, it being fairly new, we phoned up the company in question who sent around an engineer, who in turn stated a slug had wandered into the controls and committed suicide, taking our ‘marriage saver’ with it. I was sceptical, and evidence lacking, but there were some slug trails around the wall behind the machine, and I think it might have been easier than accepting the machine had a problem. short cutting here is a long winded boring story involving hand washing dishes for a month, marital tension, threats from the second engineer who also failed to fix it to not to rock any boats or we shall be charged, lots of phone calls and finally stating in a firm voice the sale of goods act and my knowing how to file a claim through the small claims court, and lo and behold, they were able to send a new dishwasher. So, with the dishwasher pulled out, we went to have a look at where slugs could be getting in, and the answer is.. probably just strolling in through the loose pile of rubble laughingly known as a wall under the kitchen window. Obviously it needs fixing up, and this in turn led up to discuss whether this was a wall we would ever look at , or could it be made good in an ugly way. short cutting here a long and interesting discussion on how we might, ultimately reconfigure the whole kitchen..
Of course the part of the project that went wrong was the lack of lovely fireplace, in fact it had been seriously knocked around and then shored up and was a bit of a heap. We spent a good couple of weeks taking all the rubbish off it, and then realised we had to take the rayburn out if we were to proceed, and then all in a rush, it is out. Well I say a rush. removing a rayburn turns out to take all day. It is now in a few parts waiting it’s journey to the scrap yard. We have been pushing on hard now, my ace Dad has been round helping too, as we really would like the wood fired replacement in before winter. We want to put a small woodburner in one of the bedrooms too, as we use this as our craft room, and because details to do with the state of our chimney, flues, insulation and the like, it would be a good idea to fit this at the same time as the kitchen one, so obviously that means more soot and dust and destruction in a room on the opposite side of the house. The fireplace tooks great now, I’ll do before and after pictures when it is finished.. and that could be a while off yet. Today, the heat of the midday sun drove us inside and we spent the time breaking up the concrete hearth in the kitchen, to find underneath a lovely old hearth made of bricks. It’s very beaten up, but lovely for all that. This hearth is a good inch lower than the kitchen floor, which suggests, as we already guessed, that a cement floor has been laid over the original floor. This would make sense… or not… depending on viewpoint, as the attitude of previous owners of the house appears to be to add another layer, rather than taking one away. So we have tiles on top of tiles, wall paper on top of wallpaper and no less than three layers of lino . What we don’t know, is what is underneath the concrete floor. It could just be mud. …or a lovely floor. Over the Easter weekend and the following week,we ‘did’ the floor of my son’s bedroom.It was horribly wobbly and some bits of the floor gave way a little underfoot, and as my lad is adult and not small… we worried about just how safe it was. And our son is keen to decorate his room. Before we moved here, when he was still a kid, we had promised we would decorate his room straight away, because we bought a decrepit house and had to go back on that promise due to other more pressing things getting in the way first. He was ace about that, and waited and helped with other projects. 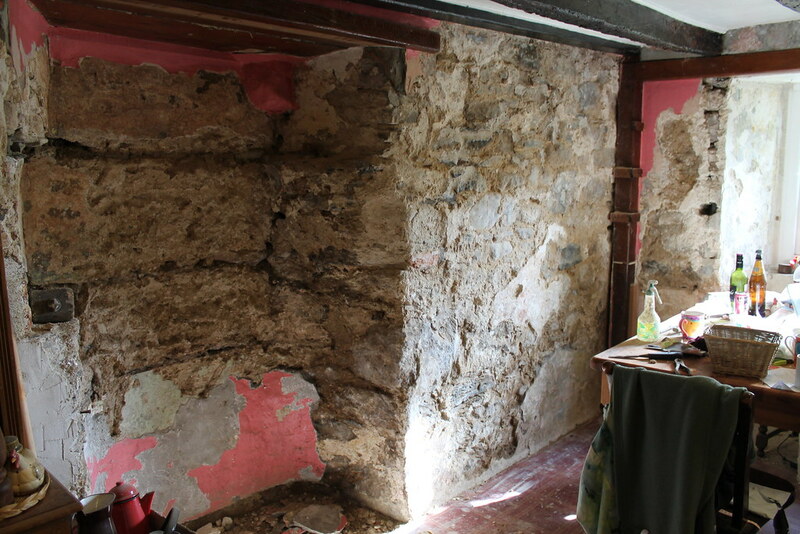 He stripped the old lady style wall paper – not hard in places as it was hanging off and badly put up in the first place, to reveal many patches of different plaster and lack of plaster etc. He was a bit previous with that, and had to live with this new decor all this time, and frankly it looked like something you see on DIY SOS, when the presenter says ‘how can a family live in this?’ – we like to watch that program and chortle. So we moved him out, and squeezed him and his furniture and all his possessions into the rest of the house – no mean feat, and pulled up the carpet to reveal the full glory of the ‘floor’ that was in place. A combination of a distinct lack of joists, thanks to the beetles, and non floor grade board thanks to cowboy builders was the problem. Along one side of the floor, there was no joist to meet the edge of the floorboards, so a series of L brackets were used to attach the floor to the skirting board. In other words, that side of the floor was held up by the skirting board, which in turn was attached to a lath and plaster wall. Anyhow..it’s all good now, with adequate joists and flooring, it is the most solid and straight floor we have in the upstairs of our home now. Unfortunate that himself slipped off a joist with one foot whilst putting the very last board down – and he crashed the one leg through the hall ceiling – and it would seem has possibly cracked or badly bruised a rib. The oddity is I was sure it would be me who did that… poor him, but he will live, and no one was standing below when he did it, and he missed the electrics so…. could be worse! The interesting thing about house renovation is seeing some of the history of the house. We have what is left of the original roof in our attic, inside a much newer roof (although these things are relative… the current roof is old and needs replacing really..), The old old roof shows when the house started life about 400 years ago, as a two up two down, and a line in the old plaster all around the room, lining up with the walk in cupboard shows the original height of the upstairs rooms, before the back of the house was build perhaps 200 years later The bedrooms would have been pretty low – and this perhaps explains why the downstairs rooms have low ceilings and the upstairs are really tall (because the house was extended upwards as well as out)… And the reason our house is not listed (yay!) because it has been changed and altered all along – and we are just part of the ongoing story. Our contribution has been to put in namby pamby strong safe features. 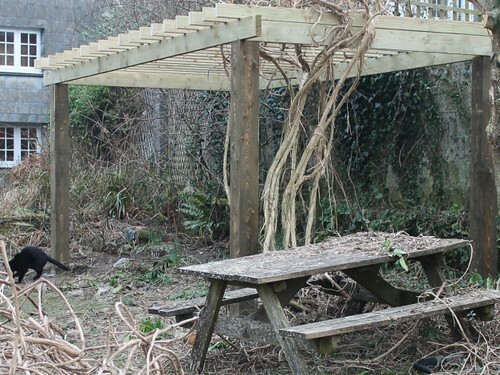 Last week we built a new pergola. We had a cherry laurel tree there, with an ancient clematis growing through it, but the tree was getting bigger and bigger, and severely shading the garden next door, and our garden underneath was dark and only really good for ivy.. of which we have too much already. tree anyway, and put it on the pergola. The shade at lunchtime was very welcome in mid summer. But after a lot of umming and arring and contacting the park authority, it would seem to be a bit of a grey area as to whether a pergola needed planning permission or not (it could be argued it is a fence?) – so to resolve this, we moved the planned location slightly closer to the house, so it fell into permitted development, and then just wouldn’t be a problem. 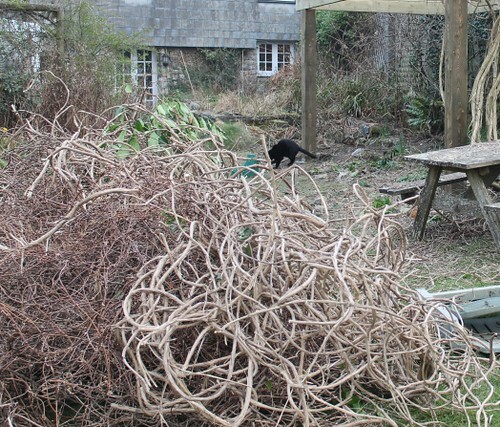 Once the pergola was up – with a little ‘help’ from the cats – we tried in vain to shift the clematis over.. but it is too old and stiff and in the end, settled for a harsh pruning. I read everywhere that the time to prune it is after the flowers – but I think this is just to avoid having a flower free year. I hope so anyway. Pruning an old clematis will either kill it or revive it.. we are obviously hoping for the latter. To hedge our bets (sorry for that pun) we planted a couple of new ones too. And I have ordered a Rose Kiftsgate – a massive vigorous white rose we have grown successfully before, to cloth the ugly wall. We hardly ever do gardening, as opposed to working the veg patches, and it feels really good. Helped by getting some sunshine and having the cats out playing alongside. Fingers crossed the old clematis makes it. 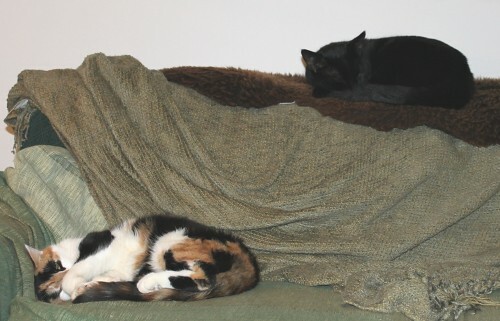 After brief debacle, in the getting new cats front, whereby a mad cat woman tried to palm us off with a feral cat, we went to cat protection and after lots of umming and arring (Cat’s can live to twentyish – so this is a two decade decision), we came home with Molly and Pete. 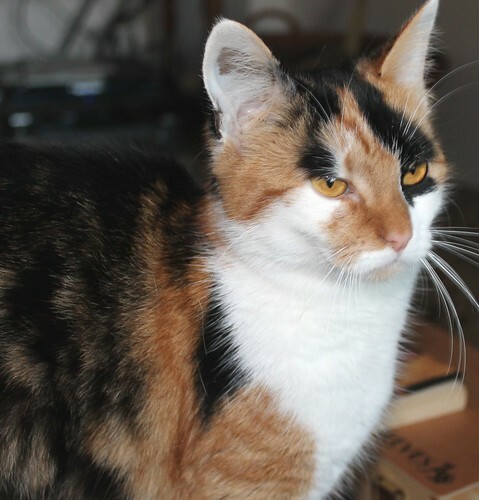 Molly is one years old and still has a fair bit of kitten in her, but is fairly affectionate and cuddly too. Pete is 2, and more cautious, but already into talking to us, and greets us enthusiastically. He is really beautiful, such an intense velvet black, with huge eyes. 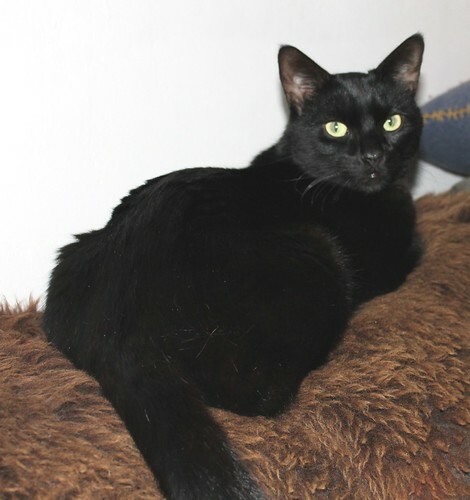 He is also affectionate, likes a good stroke, and loves to sit on the sofa behind us with a paw stretched out to touch. and it has been going stunningly well. No howling on the way home in the car, they were sprawled on the sofa the evening we brought them home, and each love the sheepskin rugs. I’m totally sold on having older cats now. 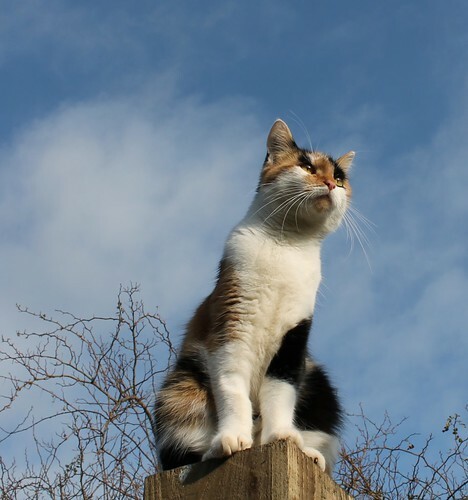 We always had kittens before, but everyone wants kittens, the older ones get left behind. And our house, in a state of renovation, is not ideal for kittens. We could imagine losing them inside a wall or something. Molly and Pete are taking it in their stride. They were startled at the wood burner, as clearly have never seen a fire before, but rapidly got used to that. Every day life, such as mixers, chop saws (DIY is fairly everyday for us) etc, doesn’t phase them. We kept them in one room at first, until they were used to us, and now they have the run of the house. A few weeks before we let them outside though, so I’m glad it is not summer and we want the doors closed.